The Cuban Amazon (Amazona leucocephala) is losing ground due to loss of habitat and the wildlife trade. Outcomes and future work: Beginning in 1990 and continuing through to 2004 several studies were begun on the two subspecies, noting population numbers, assessing threats to survival, and gathering ecological and behavioural information crucial to their conservation. The Canadian World Parrot Trust aided the efforts of Dr. James Wiley and others by soliciting members for donations of much needed items, such as 4x4 vehicles and other necessities. WPT also funded a census in 2007 to determine the number of Bahamas Parrots on the island of Abaco. Population numbers had declined due to recent hurricane activity. Beginning in 2015 WPT began supporting a new project focusing on surveying populations and initiating a nest box programme to aid the recovery of the species. Where found: A.l. leucocephala: E and C Cuba. 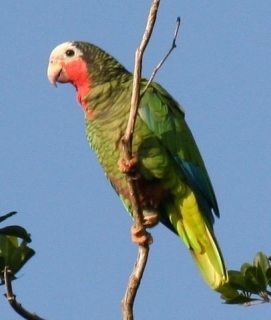 History: Amazona leucocephala, or Cuban Amazon, is recognized as Near-threatened by the International Union for Conservation of Nature (IUCN). In Cuba, the Bahamas and the Cayman Islands populations have declined (Bond 1979, King 1981, Sibley and Monroe 1990) Two races of the Cuban Amazon, the Cayman Brac and Bahamas Amazons, are facing the same threats on their native islands: severe deforestation, increased threat of hurricanes and fires, and introduced predators and human development. Ecology: The Cuban Amazon is found in pine forest, broadleaved woodland, palm groves, mangroves, plantations, cultivated land with trees and gardens, up to 1000m (3280 ft). Its diet includes leaf buds, cones, tender shoots, fruit and seeds and sometimes cultivated crops. Small groups forage for these foods with bigger groups gathering where food is abundant. Birds roost communally.